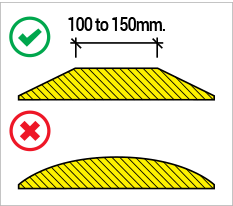 FACT: Every reseller of speed humps in Australia will tell you their products comply with the relevant standards. The reality is, many of them would not even know the detail of the standards (or care), and in the vast majority of cases their products do not comply at all. The Australian Standards through AS2890.1:2004 have been very clear about the design, use and intent of speed humps on private property. All the same, there is a proliferation of cheap, poor quality imported products being offered for sale. These products often don’t comply to the standards, are manufactured from poor quality materials of unknown origin, and are not suited to tough Australian conditions, quickly fading or failing structurally. The Australian Standard which regulates the design and use of speed humps for use in off-street parking in Australia is ‘AS2890.1:2004 parking facilities’. 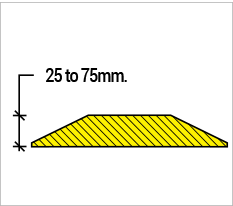 AS2890.1 identifies four main criteria in the design of “type 2” speed humps: height, cross section, ramp angle and markings. Until now very few “type 2” speed humps sold in Australia met these four criteria. Of the non-metal type, most if not all are manufactured overseas from cheap, very poor quality reclaimed materials of variable origin which quickly breakdown, fade or fail under Australian conditions. Height: Must be between 25 & 75mm. Cross Section: Must be flat on top. Not round or peaked. 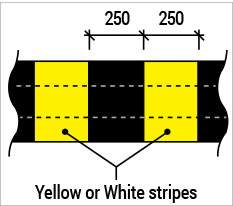 Markings: Must have alternating yellow or white stripes 250mm wide. Appropriate for use in relatively confined areas or covered and multi-storey car parks where it is desired to further check the speed of vehicles mostly travelling at 30 km/h or less. 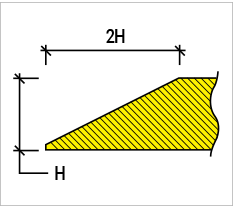 Road humps shall be spaced at no less than 10m for Type 2, along any one aisle or roadway. Maximum spacing where required to control speeds continuously along a roadway should be about 50m. Humps should be located clear of intersections and curved road ways. Humps shall not impede pedestrian or wheelchair traffic on any accessible travel path provided for people with disabilities. Note: An accessible path of travel needs to be a minimum of 1m wide.